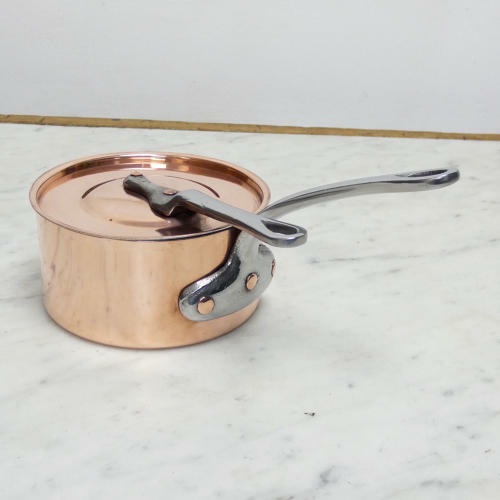 A small, French copper saucepan and cover, dating from c.1920. Although this saucepan is a little later than we usually sell, it is good quality and it is a useful size. It is made from quite a substantial gauge of copper. The steel handles are the typical French shape but the lid is quite different to usual and it fits firmly into the pan. It is in excellent condition and the interior has been re-tinned so that it can be used. The pan itself measures 12.8cm. diameter by 6.7cm. deep. The other sizes given are the overall dimensions.